A stunning 90-minute audio drama, probably the first Shakespeare play ever performed in the original pronunciation and recorded in this medium. It features the same stunning cast that presented the stage production to such acclaim in 2010. 1. A Midsummer Night's Dream, Pt. I. 2. A Midsummer Night's Dream, Pt. II. 3. A Midsummer Night's Dream, Pt. III. A Midsummer Night's Dream. The world's first radio production of a Shakespeare play performed in the original pronunciation. 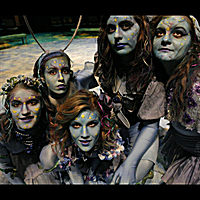 The same celebrated cast as the original stage production, produced at the University of Kansas.